The last couple of weeks have been surreal. The world is still coming to grips with the fact that one of the most promising young cricketers of this era is no longer among us. After what seemed like eternal numbness, cricketers are pledging to move on. Hughes’ funeral, which saw an outpouring of emotions, also helped create a closure (at least at the physical level) of sorts. A day later, the BCCI announced the 30-man probables list for the 2015 World Cup, overflowing with youngsters, effectively ringing the career death-knell for five heroes of the 2011 triumph – Yuvraj Singh, Virendar Sehwag, Gautam Gambhir, Harbhajan Singh and Zaheer Khan. Barring a miracle (read: major injuries among the set of 30), World Cup 2015 is over for them, as are perhaps their careers. There have been two distinct sets of reactions – an outpouring of grief among respective fans, who have flocked to various social media channels to express their displeasure. On the other hand, gurus of the game have endorsed the pragmatism behind the omission, pointing out the quintet’s deplorable stats of late. This article looks to reconcile the two, or at least present it, via a quadrant analysis. Readers acquainted with usual quadrant methodologies would know that the top-right is the place to be. But given that we are comparing both batsmen and bowlers on a common graph, I tweaked that a bit. X-Axis: The horizontal axis measures fan-sentiment with respect to the players in concern. ‘Measures’ may not be the best terminology here, as this is essentially subjective, based on the vociferousness of the recalls for these cricketers, across social media as well as traditional channels, in recent times. While the negative axis is just for aesthetic appeal, it is anyone’s guess that all these players will be in the positive on this parameter, i.e. to the right of the Y-axis. Y-Axis: The vertical axis plots the batting averages for Yuvraj, Sehwag and Gambhir, and the bowling averages for Harbhajan and Zaheer in List A cricket from the 2012-13 season till date. The median is considered at 30, which, according to me is the minimum acceptable limit for both batsmen and bowlers. Therefore, the place to be is the top right for batsmen, and bottom right for bowlers. Now let us have a look at the individual performers from both perspectives. I will rank them in order of deservedness in ascending order, from the least deserving to the most. Bear in mind that it is ‘relative’ analysis, and the most deserving in a relative context may not be in an absolute one. Zaheer Khan has been one of my favourite cricketers over the years. Ever since the guy, reminiscent of a left-handed Imran Khan due to his exaggerated delivery jump, burst onto the international scene during the ICC Mini World Cup in Nairobi at the turn of the century, with those 140kmph+ yorkers. I forgave him for the first over in the 2003 WC final. I rejoiced as he evolved into an excellent Test bowler in the latter half of the decade, architecting a few memorable away wins (did someone say jellybean?) while mentoring a surprisingly large pack of quicks, a pleasant luxury to have in a sub-continental country not called Pakistan. I did not expect him to succeed in 2011, but he proved me wrong, emerging as the joint highest wicket-taker in the tournament. Looking back, Zaheer has always raised his game when playing in a World Cup. For all the adulation, I cannot bury my head in the sand and demand for his inclusion in the WC 2015 squad. The man has not played List A cricket since the Sri Lankan tour in 2012, when he was carted around the park, his 4 wickets costing 57 apiece. Even if I look at his recent First Class performances, in Tests against South Africa and New Zealand, his wickets came at an average of 40+. He has not played in any domestic tournament of note this year. How exactly can he be considered? Yet, there is a huge clamor for his inclusion in social channels, which is why I have given him a ‘4’ score on Sentiment. I tried to assign the slightest thread of logic to this sentiment, but failed miserably. Harhajan Singh has never really set the ODI stage on fire, except perhaps the 2001-02 season, where, buoyed by a successful Test series against Australia, he picked up 29 wickets at a sub-20 average. He is the only member of this quintet who is a step behind the other four, in the context of being a 2011 WC hero. Being a member of a WC winning squad definitely makes him a hero at some level, but his abysmal performance in the tournament – 9 wickets at 43 apiece, may have derailed India’s dream, had Yuvraj not stepped up with 15 wickets, which effectively masked the Turbanator’s failure. Harbhajan continues to walk the thin line between mediocrity and poor in List A cricket, having picked up just 18 wickets at nearly 40 apiece in the past two years. His average in the current season is worse, being just 2 short of a half-century. Even his 2011 WC inclusion was a semi-emotional one. Selectors were not likely to commit the same error twice. Thankfully, not too many are protesting. Let’s face it. Virender Sehwag’s credentials in ODI cricket are nowhere close to the awesomeness he exuded when playing the longest format of the game. A 15-run dip in batting average bears testimony to that. However, he did have a great 2011 WC, even though nearly half his tournament total of 380 runs came in the opening fixture against Bangladesh. While I am not belittling the Bangla tigers in their own den, it does mean that the Sehwag made just 200 more in his remaining 7 innings at a sub-30 average – nothing to write home about. Sehwag’s career is a paradox in itself; with a game-play tailor made for ODI cricket, the Nawab of Najafgarh kept shocking pundits with an uncanny consistency in whites. They kept extolling the virtues of footwork while he became a living case-study on hand-eye coordination. Alas, good things don’t last forever. Over the past couple of years, the reflexes have slowed, even against domestic bowlers, and the happy hand-eye marriage looked on the rocks. In 13 List A matches since the 2012-13 season, Sehwag has scored 263 runs at an average of 20. This season, he made just 131 in 6 innings; it includes a Sehwag-of-old 68-ball 80 blitzkrieg against Haryana during the Vijay Hazare trophy. Simple math will tell you how he fared in the remaining five. Sehwag has an equally, if not more, compelling fan-following, who were roused even more by the disclosure, a couple of days before the release of the probables list, of the man’s ‘hope’ of being selected for the 2015 WC. It would have taken a very brave group of selectors to include him; thankfully, sanity prevailed. Shak Rukh Khan is a marketing genius. Say what you will about his movies, but he knows a thing or two about ROIs. Which is why, when he spent a whopping $2 million on acquiring Gautam Gambhir for his team KKR in early 2011, it made perfect marketing sense to include within one’s fold the future captain of India. Gambhir was probably at his peak, and with the 0-8 thrashing just around the corner, the move appeared to be the right one, even in myopic hindsight. However, Dhoni held on, and Gambhir’s own form slipped, at least at the national level. He did lead KKR to 2 titles in 3 years – no mean achievement for a team languishing towards the bottom during inaugural editions of the IPL. But taking into account his diminishing stock as a cricketer beyond the franchise, the ROI may not have been as expected in this case. Looking at recent List A stats, Gambhir has not fared much better than Sehwag; 684 runs in 30 innings at an average of 24 since the 2012-13 season. Coincidentally, both Gambhir and Sehwag tasted success together this season. Gambhir made 93 in the same match against Haryana, who must be wondering what insipid magic their bowling conjured up to revive not one, but two out-of-form players. Unfortunately, like Sehwag, it was his only innings of significance this List A season. Since his sparkling 167 for North Zone during the Duleep Trophy semi-final went unnoticed during team selection for the Australian Test series, it is likely to have been equally invisible when selectors went about their first level inclusions for the WC. Fans are not overtly vociferous for Gambhir’s inclusion – I completely respect and endorse their views. To cut a long story short, Yuvraj Singh was the biggest hero of the 2011 triumph, a title accentuated to the nth degree in light of the deadly disease he was carrying within at that time. From being dismissed as talentless by his father’s friend Navjot Singh Siddhu, to being subject to a rigorous training program which often bordered on torturous, Yuvraj’s childhood was anything but a bed of roses. He was introduced to success early in life, and like the protagonist of a clichéd movie script, quickly descended into the furnaces of failure before emerging like a phoenix for a great victory. Unfortunately, life differs from movies in continuing even after the climax, and when that happens, anti-climaxes are not far behind, as is the case now. In case you glance over at the quadrant, you may notice that Yuvraj is the only one who scrapes into the ‘acceptable’ zone. While only his batting credentials are considered in the quadrant, he continues to be a useful change bowler with the happy knack of picking up wickets. All this, with a significantly weakened body and mind, with the latter only fueled by the exuberance of playing again for the nation. Yuvraj commands a huge fan following, yours truly included, driven by the superhuman grit he showed in first holding off the Big C to lead India to their best moment in nearly 30 years, and then defeating it to return to active cricket in surprisingly quick time. As I said at the onset, being the best among the quintet may not warranty safe passage. Yuvraj continues to be the best among them. However, the numbers are not enough. A couple of big scores this domestic season may have turned the tide in his favor. But it was not to be. From an emotional viewpoint, Yuvraj’s omission is unfortunate. From a pragmatic POV, there is no justifying his inclusion. It is absurd to consider inclusion of a man who has not played any List A cricket for the past 3 years, and has limited match practice across other formats as well. Zaheer’s exclusion was a definite no-brainer. Its high time we stop over-crediting Harbhajan as a key architect of the 2011 WC win, though his mere presence in the WC winning squad immortalizes him as a hero in cricket annals. However, he has had a relatively lackluster ODI career, and continues to be mediocre in recent List A performances. Gambhir and Sehwag follow a similar pattern to each other. They have very few runs under their belt, with both their season-best performances coming in the same game. Yuvraj is the only one among the quintet to scramble into the ‘Acceptable’ zone of quadrant analysis. However, recent numbers are just not good enough for selection. While many have complained about the selectors’ ‘callousness’, others have hailed the move as brave. As for me, I am absolutely convinced about one thing. The decision wasn’t a brave one by the selectors. Given the performances of the Outgoing-5 in recent times, it was the ONLY one possible. There are nearly 200 countries in the world. About half of them play cricket. More precisely, about half of them play cricket within the fold of the International Cricket Council (ICC), the sport’s governing institution, segmented across classifications like Full Members, Associate Members and Affiliate Members, in decreasing order of hierarchy. Today, the sense of competition, within individual segments, and occasional marquee events like the World Cup, which allow the ‘lesser’ mortals to rub shoulders with the big boys, is cut-throat, often rendering the ‘gentleman’s game’ a redundant phrase strictly restricted to reminisces of a bygone era. The ‘today’ I referred to, ended, at least momentarily, a few days ago, and has been replaced with a new dimension, also going by the same name, but which begs a slightly different description. Today, the cricketing world stands united. Today, events and visuals not often associated with the game in recent times are upon us. Missing are the mind games and verbal volleys customarily preceding a big-ticket series. A rest day has been observed in the middle of a Test match, something not witnessed at this level since the turn of the century, other than for cosmic or political reasons. Cricket superheroes have been pictured openly weeping or holding back their tears with an effort, clinging onto each other, drowned not by the ecstasy of decimating an opposition, but an overwhelming grief which has descended like a joy-sucking shadow, one that threatens to not lift anytime soon. Two moments have changed modern cricket forever – the first, when news and disturbing images, of a young man felled by a bouncer and in a state of coma, started flashing across television screens and sports websites all over the world. Though horrific, most would have pushed their worst fears into the deepest corners of their hearts. Surely he would recover, the worst case scenario being premature retirement. Nothing worse could happen, not in today’s age of technological and medical marvels. Unfortunately, our absolute dwarfness in front of some greater power was highlighted by the second moment, which, had it not happened, would have pushed the first into inconspicuousness. The second moment was, for me, a sucker punch of immeasurable power. As I logged in at work, a colleague told me that the young man had passed away. It did not register. I pried open my laptop and blazed away on the keyboard a name which was punched into search engines several times in the past couple of days. The results showed up, confirming what my brain already knew but my mind refused to acknowledge. After a two-day battle, the young man, Philip Hughes, had left the earthly pitch in favor of a heavenly one. The initial feeling was still disbelief, immediately followed by a keen sense of disorientation. Then my fingers started transporting me to multiple social media platforms without any specific instruction from the brain. I am not a crying person, not for someone I never knew personally, and certainly not in an era where details surrounding unnatural fatalities, of every kind, are streamed into our living rooms via a variety of media channels, traditional and social, the fodder for which is abundantly available, with man and nature appearing to compete with one another for the title of superior killing machine. However, as I ran through the stream of reactions coming in, from celebrities as well as lesser mortals, I noticed my eyes moisten and a lump appear as if out of nowhere in my throat. Tributes have poured in for Hughes, plucked away just days shy of his 26th birthday. I have not done a lot besides going through most, all stating a similar story at the core, but personal emotions adding a subtle variation as unique as life itself. I cannot claim to know the man half as well as some of these people, but stand united with most in the world, some of whom may have come across his name for the first time, encapsulated by this overbearing grief which, like some kind of wrecking ball, has shattered most boundaries within cricket, hierarchically or otherwise. Like those not well accustomed with Australian domestic cricket, my earliest memory of Hughes was his dramatic entry into Test cricket in early 2009. Playing the South Africans, in their own backyard, and opening the innings against a bowling attack comprising Dale Steyn, Morne Morkel and Makhaya Ntini, is nothing short of baptism by fire. He failed on debut, at Johannesburg, caught behind for a duck while attempting an outrageous over-the-slips slash off Steyn. The short lived innings sent out two messages. Firstly, he had the most unconventional technique for an opener, and secondly, he knew no fear. Hughes’ next three innings proved exactly why he was rated so highly, and likened to no less than Sir Don Bradman at the start of the original master’s career. A match-winning knock of 75 in the second innings was followed by centuries in each innings of the Second Test at Durban, which Australia won easily and the left-hander picked up a Player of the Match award for his efforts. After the bright beginning, Hughes’ Test career descended into obscurity over the next three years; but for an occasional exploit here and there, he was a largely unknown entity to me during this period, and my sub -conscious had already bracketed him as another statistic in the list of cricketers unable to realize their full potential. It was in December 2012, during the Sri Lankan tour Down Under, that I followed a couple of his innings on live television. It took me a while to associate this much more compact batsman with the swashbuckler of nearly four years back. Hughes, now playing one-down, was solid against pace as well as spin, looked in far greater control, and seemed to have traded some of his agricultural shots of yore for more traditional ones. Another noticeable change was his confident on-side play, which was largely non-existential during his debut series. The only time I followed Hughes through an entire Test series, came soon after, during Australia’s tour of India in early 2013, infamous not just for the walloping suffered by the tourists, but also the Homeworkgate saga. Among several insipid batting performances by the visitors, Hughes’ 69 during the second innings of the Third Test at Mohali stood out. On a difficult pitch and against the rampaging spin trio of Ravichandran Ashwin, Pragyan Ojha and Ravindra Jadeja, the diminutive batsman stood tall amidst the ruins (none of the other Aussies crossed 35). Hughes looked set for a match-winning/saving and career defining century when he was felled by an absolute howler by umpire Aleem Dar, possibly his worst decision in a relatively immaculate career. Australia lost the Test match, and the next, and Hughes’ Test career looked under threat. Yet again. The final time I saw Hughes in whites was largely by accident. I was not really following the 2013 Ashes series in England, beyond score updates. England were bundled out for 200-odd in the first innings of the opening Test at Trent Bridge, and Australia, in reply, had lost nine wickets for a little more than 100 runs. I noted that Hughes was playing further down the order and was still at the crease when debutant and number 11 batsman Ashton Agar joined him. When I checked back about an hour later, expecting the English openers to be back in the pavilion, I was in for a major surprise. The Australians were still batting, both batsmen were 50+, and Agar was outscoring Hughes. I abandoned whatever I was doing and headed to the nearest available television to witness what promised to be history in the making. The debutant had thrown caution to the wind, and was striking it at run-a-ball as he broke into the 80s, looking set to become the first number 11 to score a Test century. Hughes was painstakingly unselfish, allowing his younger partner a majority of the strike towards the latter half of their partnership. Agar fell, heartbreakingly two short of a record creating century, while Hughes stayed unbeaten on 81, in what was hailed as one of the best knocks of his career. ESPNCricinfo’s Daniel Brettig believed that a technically superior Hughes, displaying immense poise while playing with the tail, looked like the perfect replacement for Michael Hussey in the middle-order. In hindsight, Brettig couldn’t have been more wrong. Hughes failed in the next Text, at Lord’s, and was dropped in favour of another young batsman, Usman Khawaja. He would never again play Test cricket. While Hughes once again dropped off my radar, patrons of Australian cricket were clamoring for his inclusion in the national Test team. In early 2014, former skipper Allan Border minced no words voicing his opinion on Hughes’ absence from the national Test team. His words fell on deaf ears, as Hughes continued his never-to-be-realized wait. Despite being the first Australian to have scored a double century in List A cricket for men, Hughes’ ODI career was even shorter, mostly relegated to being a spare, filling in for injuries as and when required, and then unceremoniously discarded. Australia experimented quite a bit with their batting order during the recently concluded two-match Test series against Pakistan. The unhappy result increased the fervor of demands for Hughes’ recall. Considered alongside the inevitability of Michael Clarke’s unavailability for the First Test due to injury, Hughes looked set for yet another shot at pursuing his dream. Then the first moment happened. And of course, the second. Numerous questions have surfaced in the aftermath: Why did the ambulance reach 15 minutes too late? Would the latest helmet model have saved Hughes? How will Sean Abbott cope? How will close friends and colleagues cope? Should the Test series against India have been called off? Will the Mitchell Johnsons and the Varun Aarons unleash the short ball with the same frequency? Should bouncers be banned? Have batsmen become more complacent due to excessive protective gear? The list can go on. And so can the debates around it. But one harsh reality stares us in the face. Philip Hughes is no longer among us. I have come to know a lot about the man in the past few days. His upbringing, his familiy, his likes and dislikes, his dreams, his attitude, and above all, his unconquerable zeal to play for his country at the highest level. For an outsider like me, many of these were unknown during his lifetime. But one aspect of his remains etched in my memory. His smile. Not a sneer sported by many cricketers today, perhaps to position themselves as competitive, but a warm, genuine, ready smile. Not cocky or arrogant, but a pleasant cross between shyness and quiet confiedence in one’s abilities. A friendly face in an ocean of aggressiveness, exuded by cricketers all over the world today. That’s what made him stand out, for me. At about 5’7 (170cm), Hughes’ physical presence was in direct contrast to his name, as well as that of his yesteryear nameake, Merv, who incidentally played an important role in young Phil’s selection for his debut Test. Measured in terms of impact on the game, in life, the South Australian had the potential to make it big – really big, if the words of those who followed him through his formative years are to be believed. 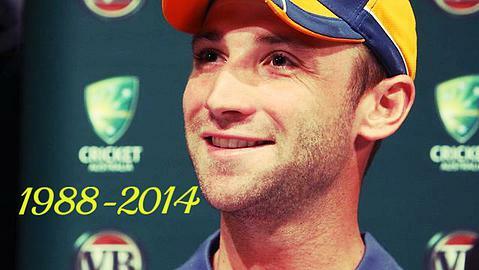 In death, Hughes towers above every other living cricketer today, irrespective of their achievements. In a sad paradox, death has made Hughes immortal. To conclude, I quote from the most touching tribute I came across, dedicated by ex-cricketer and former national batting coach, Justin Langer, who was at Hughes’ side during his final moments. Lying lifeless he still looks so strong. His heart is pumping and his chest rising and falling. Rising and falling. Get up little fella, get up. He is lying in his hospital bed. I have my hand on his arm and I am begging him to wake up. Come on little fella, wake up, it’s time to get your dancing shoes on, it’s time for another hundred. You’ve never been broken, you can do it again. They are turning off the machine. Moments later our little brother, our little mate, our son has passed away. C’mon little fella, get up champ, get up. For the first time in his life he can’t. But you know what, little fella? It’s OK. Keep sleeping. You have left an indelible mark. Rest In Peace little champ. RIP Hughesy. You will be missed. Sri Lanka will think twice before playing the Good Samaritan in future. What began as a good-will gesture to play 5 ODIs in order to make up for the West Indies’ dramatic mid-series exodus, has culminated in a progressive nightmare for the islanders, who were blanked 5-0 at the hands of an Indian side sans skipper Mahendra Singh Dhoni, and experimenting to the hilt. Trouble was brewing even before the islanders arrived – in an increasingly evident dichotomy between interests of players and boards, Lankan veteran Kumar Sangakkara expressed his displeasure at the abrupt scheduling of the series, which cut short their preparatory fitness program overseen by former national rugby union captain Chandrishan Perera. Add to that the absence of a few key stars, as well as Sri Lanka’s dismal record in bilateral series against the hosts, and not many would have expected an upset, but the sheer lack of competitiveness in the series, especially after the Lankans’ successful run in 2014 ODIs thus far, was quite disappointing. An 88-run defeat at the hands of India A in the only warm-up match provided crucial insights on what was on offer – the Sri Lankan bowling was toothless and toyed with by Rohit Sharma in his first competitive match after injury, and Manish Pandey, both making big centuries. The Lankans never looked comfortable during the 383-run chase and wilted against Indian spinners, the best among whom was Karn Sharma, returning figures of 4-47. India went on to stamp their authority on the series from the very 1st ODI in Cuttack – racking up 363 runs on the back of centuries by openers Ajinkya Rahane and Shikhar Dhawan, before the bowlers snuffed out the Sri Lankan chase, inflicting a humiliating 169-run defeat on the visitors. The quick bowling on display was particularly impressive, with Varun Aaron breaking the 150 kmph barrier a few times in a four-over burst before breaking down himself, and Ishant Sharma and Umesh Yadav picking up 6 wickets between themselves. The 2nd and 3rd ODIs, at Ahmedabad and Hyderabad respectively, followed a set pattern – Sri Lanka won the toss to bat first on both occasions, and struggled to post totals in the vicinity of the 250-run mark, before India knocked off the runs gleefully without breaking much of a sweat, winning by six wickets with more than five overs to spare in both matches. Hyderabad confirmed that the series was already won, and ominous signs of a washout were very evident. The 4th ODI at Kolkata was Sri Lanka’s nadir of the series, where extremely low standards of bowling and fielding helped Rohit Sharma become the first man to make 250+ in an ODI, as India breached the 400-mark barrier yet again. The Lankans then caved in without a fight, registering yet another 150+ run defeat margin, the physical and psychological scars from the Rohit mauling, perhaps being too much to handle. The utter one-sidedness of the contest was highlighted by the fact the Sri Lankan team total was 13 runs short of Rohit’s individual score, with the islanders merely going through the motions by then. The final ODI at Ranchi saw the Lankan skipper Angelo Matthews take on India almost single-handedly, scoring 139* to help his team register 286 on a difficult pitch, and then opening the bowling to dismiss both Indian openers with only 14 runs on board. Matthews conjured up images of an elusive victory, but was unlucky to run into his equally determined opposite number Virat Kohli, who essayed one of his best innings in recent times, shrugging off Amabati Rayudu’s run-out as well as self-destructive batting by the Indian middle-order, to exactly match the Lankan skipper’s score, and took India over the finish line with 8 balls to spare, in what was easily the most competitive match of the series. Sri Lankans have hardly any positives to take from the series, expect for the grit exhibited by their skipper, who topped batting charts with 339 runs at an average of 113, and did the best he could with the ball and in the field as well. Mathews fought valiantly, but was let down by a team which seemed to have left their sprits as well as their A-game back home. Overall batting statistics, while nowhere near what is expected by a team of their calibre, were still tolerable, but the Lankans’ bowling performance was catastrophic to say the least. Indian batsmen were never under pressure, and their few moments of anxiety stemmed mostly from poor running between the wickets, and mindless batting in the final ODI. For India, the series serves as an immense psychological boost ahead of more difficult challenges. Kohli’s innovative captaincy, both in terms of team selection as well as on-field strategy, came across as a breath of fresh air. Akshar Patel and Umesh Yadav were excellent in conditions tailor-made for batting, while almost all top-order batsmen feasted with relish on the sub-standard bowling dished out to them throughout the series. With very few ODIs remaining before the 2015 World Cup, Sri Lanka will be desperate for a better showing against the touring English team later this month. India head to Australia, and will look to carry forward the positive momentum Down Under, in conditions and against an opposition very different from the just-concluded series. One can only hope that this easy victory does not breed any complacency among players, though that term is usually redundant when facing one of the best teams in the world in their own backyard. The BCCI can definitely pat its back, with its SOS to the Sri Lankan cricket board yielding sporting as well as financial gains in the backdrop of the escalating conflict with West Indian cricket, though it remains to be seen if the islanders will ever respond with such promptness after this absolute nightmare, which will take a while to recover from. An injury to Mahendra Singh Dhoni has given both critics and fans the chance to realize what they have been baying for over the past few months – see Virat Kohli captain the Indian team in the longest format of the game. While the Young Turk’s role is likely to be restricted to the 1st Test of the the 2014-15 Test series against Australia, at Brisbane, before Dhoni resumes his duty at the top, it would still be interesting to see if he can make some sort of impact in the blink-and-you-miss opportunity extended to him. Kohli, who has an 80% success rate in the 15 ODIs he has captained the country, also takes his batting to the next level (Avg. 58.63 and SR 97.13 as captain are even better than already brilliant career statistics of avg. 51.3 and SR 90.01) when entrusted with the top job. While he has been impressive in the ongoing series against Sri Lanka, displaying plenty of innovation in both team selection as well as on-field strategy, captaining in a Test, that too against the Australians at home, can be a different prospect altogether. A quick look at what he is up against: The Australians are just back from a mauling at the hands of a rampaging Pakistan team in UAE, and a T20 series victory and possible ODI triumph against South Africa is not likely to ease the humiliation of the one of the biggest Test series drubbings handed out to them in quite a while. When the teams step onto the Brisbane pitch on the 4th of December, the Aussies will come hard , in what is their first shot at Test redemption post UAE. The pitch at the Gabba is traditionally quick and bouncy, with plenty on offer for the bowlers initially before easing out into a batsman’s paradise. In the one-off opportunity extended to him, the best statement Kohli can make is probably with his bat. Under a lot of fire after continuous failures in England, the dashing Delhiite can take inspiration from former skipper Sourav Ganguly’s sparkling 144 on this ground, exactly 11 years ago, coincidentally also from December 4th to 8th, to make a big score and send out a strong message to selectors that he is ready to take over the Test captaincy crown, currently uneasily resting on Dhoni’s head. Kohli, whose irritatingly identical dismissals in English conditions highlighted his helplessness against prodigious swing, should definitely prefer the quicker and bouncier, but relatively less swinging tracks Down Under. In terms of resources, the selectors have provided plenty of variety, and it remains to be seen if Kohli will ‘play safe’ or take a few risks. His sidelining of Ravindra Jadeja in the ODI series against Sri Lanka sent out a strong statement that he will not necessarily patronize players backed by Dhoni, and if given a similar freedom in Brisbane, we could be in for a few surprises. I do not expect the batting order to be disturbed much, irrespective of how the practice games go. KL Rahul has been in scintillating form, but even if he cracks a couple of centuries in the warm-ups, in all probability, it will be Shikhar Dawan and Murali Vijay walking in as openers. The Wall’s namesake and states-person will definitely breathe down their necks, and failures by either of them could see the young opener make his debut in the 3rd Test. The middle order is fairly settled, and I do not see Kohli making any changes there, unless someone gets injured. Suresh Raina, though a much improved player technically now, will most likely be relegated to being a useful substitute fielder throughout the series, barring an alarming dip in form among the current middle-order. This brings me to the first masterstroke which Kohli can play. The practice games should see both wicket-keeper batsmen, Wriddhiman Saha and Naman Ojha, going head to head, and if the latter can make an impact, he could be played ahead of Saha in Brisbane. The inclusion will be relatively risk free, if backed by performances in warm-ups, because Saha himself would be expendable from the 2nd Test onwards. If Ojha, who has been in red-hot form, plays and makes runs at Brisbane, it could pose a few selection dilemmas for the remainder of the series, and Kohli could be hailed as a visionary captain for this act alone. The next, and definitely more risky gamble, would be the inclusion of Karn Sharma as sole spinner in the playing XI, assuming that he will out-bowl Ashwin in the practice games. Do note that I am restricting the battle to between Ashwin and Karn, because Kohli has not shown any faith in Jadeja, and is therefore unlikely to consider him, unless Sir comes up with something absolutely spectacular in the run-up to Brisbane. Getting back, Karn, or more specifically, a leg-spinner, gets my vote for two reasons. Rahul Dravid’s observation of leggies being more successful Down Under can be taken a step further when we consider that Shane Warne has been at his best while playing at Brisbane – he has picked up 68 wickets in 11 Tests, at an average of 20.3 (as opposed to his career average of 25.4) including his career best of 8-71 against England in 1994-95. Therefore, if a leg-spinner is to be blooded on an Australian ground, Brisbane is perhaps the best option. Besides, Ashwin’s overseas record is nothing to write home about, so his exclusion will not come as the biggest shock either. Kohli is unlikely to experiment too much with the three quicks. Bhuvneshwar Kumar is one bowler who can be relied upon to be the ‘workhorse’, bowling steadily and accurately, and is least likely among the five medium-pacers in the squad to breakdown. Add to that his improved batting skills, and Kumar will be a certainty in the XI. Given his love for pace, Kohli would have loved to unleash both Umesh Yadav and Varun Aaron, the quickest bowlers India currently possess. However, Aaron’s propensity to get injured at surprisingly quick intervals will be a deterrent, and it will be extremely risky to include him in the XI in the 1st Test. Rhythm is important for a quick, and the two practice games will likely help in picking two from Yadav, Mohammed Shami and Ishant Sharma. The first two are relatively similar in terms of pace and lengths. Shami’s experience will make him a safe choice, but the fact that he is just coming off an injury and Yadav’s form against Sri Lanka tilt the balance slightly in his favor. If Ishant is fit, Kohli should include him, as his height and ability to hit the deck will be key differentiators on Australian pitches. Brisbane XI (if Kohli plays safe): Shikhar Dhawan, Murali Vijay, Cheteshwar Pujara, Virat Kohli, Ajinkya Rahane, Rohit Sharma, Wriddhiman Saha, Ravichandran Ashwin, Bhuvneshwar Kumar, Mohammed Shami, Ishant Sharma. Brisbane XI (if Kohli takes risks): Shikhar Dhawan, Murali Vijay, Cheteshwar Pujara, Virat Kohli, Ajinkya Rahane, Rohit Sharma, Naman Ojha, Karn Sharma, Bhuvneshwar Kumar, Umesh Yadav, Ishant Sharma. These equations could change dramatically with three weeks still to go for the 1st Test. Kohli’s ODI captaincy stint has definitely been positive, but whether he will impress or not in a single opportunity at the highest level against a team raring to make amends for recent lapses – only time will tell. Sachin Tendulkar’s autobiography: Will Greg Chappell have the last laugh? All hell broke loose a couple of days back, when Sachin Tendulkar’s scathing criticism of former coach Greg Chappell in his autobiography, Playing It My Way (released yesterday), became breaking news across the country. As captured in the preview shared with media, in addition to describing Chappell as a ‘ringmaster’, Sachin went on to drop a bomb by alleging that the Australian even tried to persuade him to take over captaincy of the Indian cricket team from Rahul Dravid, just months before the 2007 World Cup in the West Indies, so that, in Chappell’s words allegedly, ‘together, we could control Indian cricket for years’. These, and further accusations have evoked a plethora of reactions, and created sharp divides among fans as well as cricketers, the repercussions of which may not bode well for the Indian cricket team. Let us look at the first divide, between the opinions of lesser mortals like you and me, relatively harmless, and providing good fodder for raging debates. Opinions, and given the omnipresence of social media today, comments and tweets have flown left, right and center soon after the claims were made public. While most fans have stood up to their ‘God’, lapping up and hailing every word, others have questioned the timing and necessity of the allegations. From being a marketing gimmick to exacting revenge on Rahul Dravid for stranding him on 194* in the Multan Test, 2004, counter-allegations have been intense as well as imaginative. Having not yet laid my hands on the book, I will also leap on to the opinion bandwagon without much evidence, though I doubt if answers to all of these will be available even after reading the autobiography. On being a marketing gimmick by Sachin, my opinion would be yes, and no. Let me explain the affirmative part first. The content of the excerpts released to the media, as well as the timing, coming just two days ahead of the book launch, will definitely increase book sales by 15-20%, if not more. While an autobiography of a living demi-God would not have a shortage of takers, the only road-block it could have encountered is the perception of lack of spice in the book’s content, if one goes by the relatively devoid-of-controversy career of the batting legend. This perfectly timed release definitely allays all fears in that context. Now the more difficult explanation of the no following the yes – I find it difficult to accept that someone of Sachin’s stature would personally stoop to the level of performing publicity stunts to make a quick buck, but that doesn’t mean that the PR agency, in all probability tasked with marketing responsibilities associated with the release, wouldn’t do that. If the Chappell saga constitutes a sizeable portion of the book, my defense of Sachin weakens, and the preview would indeed be justified, but if it ends up being a short section within the overall World Cup 2007 debacle, which is undoubtedly one of the most painful memories of the maestro’s life, then I will uphold my third-party sensationalism theory. The Dravid revenge angle is strife with speculation – while it can be argued that the modern Little Master, who tackled the fastest of bowlers with a straight bat, might have preferred to go that route in this case as well, and channelize his feelings on the unexpected declaration in a direct manner, there is also the counter that Sachin would not like to launch an all-out assault on his brother-in-arms in several battles, and possibly the second-most loved cricketer in India, after himself. Plenty of food for thought here, which hopefully the autobiography will have answers to. This brings me to the second and definitely more unfortunate divide, one among the players themselves. While most cricketers active during Chappell’s reign have sided with Sachin, a disturbing development is the early aloofness and then curtness exhibited by Dravid in the aftermath of the preview. His initial statement, “I am sorry but I haven’t read the excerpt. That was a private conversation between two people and I am not privy to that”, in an interview with ESPNCricinfo, seemed to be a diplomatic attempt to avoid an awkward situation, being the gentleman he is, but a parting shot at being interested more in the master blaster’s batsmanship as opposed to the controversies in the book, seemed a tad too dismissive.Dravid was not as diplomatic when it came to responding to Ganguly’s statement that The Wall had shared with him his inability to control the former coach. When asked to comment by a news channel, Dravid was brusque in denying it, and even added an uncharacteristically harsh ‘he can’t put words in my mouth’, referring to Ganguly. So far, the elegant southpaw has not responded, but if he does, of which there is every possibility given his past reactions in similar situations, it could lead to an escalating war of words between two of the greatest cricketers the country has ever produced. If one or two more cricketing heavyweights lend their voices against Sachin’s allegations, the rift would get even more pronounced; not exactly an ideal scenario for a team just months away from its title defense of the greatest trophy in limited overs cricket.Has Chappell fired an arrow from Sachin’s bow?Getting back to the alleged antagonist in the story, Chappell has issued a customary statement which categorically denies the allegations against him. In attempting to capture an opinion from Down Under, I observed that while the Australian daily, The Age, titled this story as ‘Chappell gets defensive over Tendulkar’s autobiography charge,’ the newspaper makes no effort to defend the Adelaidean, and just documents turn of events almost verbatim to that splashed across Indian dailies and websites.This leaves us with the most poignant question of all – what purpose does the reprisal of the Chappell saga serve? If the intention is to lay bare before the world the former coach’s atrocities, Ganguly did that eons ago, and in terms of credibility, there was no reason to doubt him either. On the contrary, this does pose an uneasy question on the silence of the maestro all this while. Had he been more vocal when the southpaw was screaming from the rooftops about Chappell’s inadequacies, the South Australian may have faced a swifter eviction, and his alleged negative influence on the 2007 World Cup campaign avoided. If the idea is to mete out belated punishment for tampering with a successful team, as national talent manager for Cricket Australia, Chappell’s professional aspirations are not likely to be affected. Even otherwise, the Adelaidean’s autocratic nature is no secret in cricketing echelons, and administrative bodies who rate his talent above this drawback will continue to engage with him. The only visible impact thus far has been signs of infighting among some of the country’s most respected cricketers, and if it mushrooms, Sachin would have unwittingly aided Chappell in the one mission he left incomplete – creating a public rift among the Big Four, who still command huge fan-followings even after retirement. For the sake of the country where cricket hysteria borders on fanaticism, I hope such a possibility never materializes, or for all the best intentions behind this disclosure, Chappell may well have the last laugh. On the warm summer evening of April 2 2011, history was rewritten at the Wankhede Stadium in Mumbai, when Indian captain Mahendra Singh Dhoni hoisted Nuwan Kulasaekara over mid-on for a huge six. It has become an indelible image in cricket annals. As Dhoni held the pose for the shutterbugs to confirm that India had lifted the 50-over World Cup for a second time in their history, the man at the other end, Yuvraj Singh, was relatively unnoticed on account of the hysterical celebrations the shot triggered. He must have felt a range of emotions surging through him. The man who virtually carried India through the tournament by racking up 362 runs and 15 wickets during the marquee event, in between bouts of blood mingled vomiting, insomnia and lack of hunger, had made a deal with God the night before the final, that if the Almighty gave him the Cup, he could take anything in return. With the elegant all-rounder being diagnosed with mediastinal seminoma, a rare form of cancer, soon after, it may have seemed that Yuvraj looked set to keep his end of the bargain. However, after undergoing treatment at the Cancer Research Institute in Boston, the spirited southpaw was not only declared cancer-free, but also made a return to the game. Yuvraj is in contention to make India’s World Cup squad. If he does, it will surely go down in cricketing annals as one of the most inspiring stories in the sport’s rich history. Born to alpha male and one-Test careered Yograj Singh and Shabnam on December 12 1982, Yuvraj was not particularly attracted to the gentleman’s game initially. Rather, he had his heart set on skating. His dad, however, did not share his enthusiasm, and when the barely-into-teens Yuvraj proudly brought home a skating gold medal, the senior Singh threw it out and laid out the ground rules imposingly: “From now on, you play cricket, not this girls’ sport. If you don’t play cricket, I will break your legs.”Without daring to venture into the humanitarian and sexist angles of the statement, I can confirm that this particular moment was indeed, the turning point in Yuvraj’s life, and the beginning of his association with the game, which was to introduce him to fame and glory.To get an expert opinion on his cricketing skills, Yograj presented his son before friend and then Test cricketer Navjot Singh Sidhu, who quickly dismissed him as low on talent and will power. This incident probably escalated the obsession in Yograj to see his son succeed at the game he himself did not, having played only one Test for his country, despite touted as being more talented than Kapil Dev, easily the greatest all-rounder ever produced by India.What followed was a gruelling training routine for Yuvraj, which ranged from demanding to outright inhuman at times, but one that saw him steadily improve as a cricketer and begin representing home-state Punjab in various under 16 and 19 tournaments, before earning a Ranji Trophy debut during the 1997-98 season. His first performance of note on the international stage came during the semi-finals of the ICC’s Under 19s World Cup in 1999-00, when he smashed 58 off 25 balls against an Australian attack, which included young tearaway quick Mitchell Johnson and future stalwarts Shane Watson and Nathan Hauritz. India went on to win the tournament, and selectors acknowledged Yuvraj’s talent as special, fast tracking his induction into the senior team during the ICC Mini World at Nairobi in 2000-01. After making his debut against Kenya, where he did not get to bat, Yuvraj made an impact in his very first innings. Against an imposing Australia in the quarter-finals, Yuvraj made an 80-ball 84 facing Glenn McGrath, Brett Lee and Jason Gillespie, and followed it up with a spectacular run-out of Michael Bevan to win the player-of-the-match award. The southpaw’s all-round performance against South Africa in the semi-finals, combined with more flashes of brilliant fielding, led to his quick elevation in the eyes of local media and cricket-fans as the Crown Prince (incidentally, this is what his name translates to) of Indian cricket. Tall and upright, Yuvraj, with his languid elegance and high back-lift, drew comparisons to Brian Lara during his heyday, and that was reason enough to sit up and take notice of the dashing youngster. The ‘Prince’ however, did not really stake his claim to the throne during the next five years. The strapping Punjabi was regularly in the news, but apart from customarily gracing sports pages, Yuvraj was also featured in Page 3 gossip columns, being projected by the media as a Casanova. The man himself seemed to enjoy the attention, and did his image no harm by regularly being clicked at late-night parties, often in the company of wannabe models or Bollywood starlets. His on-field exploits were relatively tepid, with the odd brilliant innings every now and then which reminded audiences of his immense potential, the most famous among which was his counter-attacking knock of 69 against England in the final of the 2002 NatWest Trophy. Yuvraj also made his Test debut in October 2003, against New Zealand, but despite a couple of good knocks while touring Pakistan in April 2004, the left-hander was dropped after failures in the first two Tests of the 2004 Border-Gavaskar Trophy, and never quite cemented a Test berth despite his obvious talents. The 2005-09 seasons were probably the best of Yuvraj’s One Day International (ODI) career, when he piled up more than 4000 runs at an average in excess of 46, about 10 more than his career average. His resurgence coincided with the debut and rise of Dhoni, and the two regularly combined to form one of the deadliest finishing pairs in ODI cricket at that time. The year 2007 was a tumultuous one for Indian cricket, having witnessed the extreme low of a first round exit during the 50-over World Cup, as well as the unexpected high of emerging champions of the inaugural T20 World Cup. Probably at the peak of his batting prowess during the year, Yuvraj was ignored as captaincy material, in favour of a relatively inexperienced Dhoni, both during the T20 World Cup and aftermath of Rahul Dravid’s resignation. The southpaw however put this disappointment aside to play a couple of brilliant match-winning knocks during the T20 World Cup – 58 of 16 balls against England, including six sixes off an over by Stuart Broad, and 70 off 30 balls against Australia in the semi-finals. Yuvraj’s scintillating form in the shortest format of the game earned him a recall for the 2007 home Test series against Pakistan, and he did not disappoint, slamming a career best 169 during the Third Test at Bangalore. He was solid, if not spectacular, over the next two years, often playing second fiddle to India’s next generation of rising superstars like Virat Kohli and Rohit Sharma, but continued to be an indispensable cog in the country’s ODI side, while resuming his dalliance with Test cricket. His form dipped in the lead up to the 2011 World Cup, marred by several injuries and bouts of illness, a possible prelude to the Big C waiting in the wings. His position in the World Cup squad was not warranted, and when he ultimately made it, not many would have expected the man to make the impact he did. Sachin Tendulkar gave these words of advice to Yuvraj at the beginning of the tournament. The Little Master was revealed as the special person to whom the southpaw kept dedicating his Cup performances. They gave a whole new direction to Yuvraj, who, like many others in the team, was desperate to win for his idol, whose only piece of silverware missing from his overflowing trophy cabinet was a prized World Cup. Yuvraj channelized his dwindling energies towards paying off the debt he owed the man who played that huge role in his life – Tendulkar himself. Showing no signs of indifferent form, Yuvraj began the tournament with half centuries against England, Ireland and the Netherlands, before failing the only time with both bat and ball, against South Africa, as the Proteas inflicted India’s only defeat in the Cup after a tense contest. Yuvraj scored 113 out of 268, and snared two crucial wickets to ensure India finished second in their group, setting up a quarter-final clash against reigning three-time 50-over World Cup champions Australia. The ‘Prince’ lived up to his name in the all-important quarter-final, by snaring the wickets of Brad Haddin and Michael Clarke, and his 2-44 were the best bowling figures on either side that day. With willow, Yuvraj helmed a difficult chase of 261 with an unbeaten 57 to take India to the semi-final, against archrivals Pakistan. In that important match, Yuvraj was bowled first ball by a searing yorker from Wahab Riaz but he once again showcased his all-round prowess when he picked up two wickets in two overs to derail Pakistan’s chase. 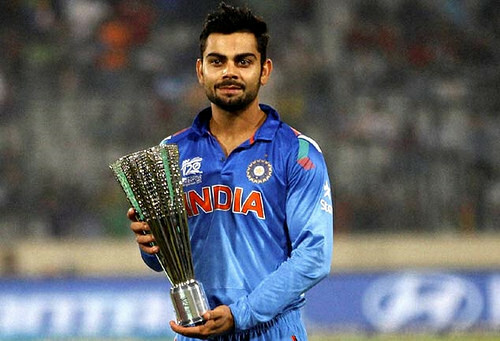 India won by 29 runs to reach the grand stage of ODI cricket. Yuvraj was sleepless on the eve of the big final, against familiar rivals Sri Lanka, tortured by pain, nausea and an uncertain future. None of that showed on field, once India was asked to field by Sri Lanka captain, Kumar Sangakkara, after quite some confusion during the toss. The ‘pie-chucker’ yet again proved to be the best among Indian bowlers, with a spell of 2-49, which included the crucial wicket of Sangakkara to restrict Sri Lanka to 274, which was a very respectable total in a tournament final. After India lost Sehwag and Tendulkar early, the chase was steadied by an 83-run third wicket partnership between Gambhir and Kohli. After the latter’s dismissal, the stage was set for Yuvraj to guide India home on the lines of his quarter-final effort against the Aussies. However, in an unexpected move, skipper Dhoni promoted himself above the southpaw, and in a way, stole some of his thunder with a perfect display of clinical batting. Yuvraj finally entered the arena once Gambhir got out, tantalizingly close to a century, with 50-odd runs still needed. With the required run-rate well under control, and Dhoni dazzling at the other end, Yuvraj was content to operate in second gear, and he ensured that no further hiccups were experienced en-route to Dhoni’s spectacular finale, which brought delirium to India’s cricket loving populace. Back on the field after a one-year gap, which included multiple chemotherapy sessions as well as recuperation post cancer remission, Yuvraj, while showing glimpses of his former self, is still largely untested in the 50-over format, and has not played a single ODI in 2014. His highs and lows in recent times have been mostly restricted to T20 cricket, from being the most expensive buy at IPL 2014 to his embarrassing helplessness against Kulasekara’s and Lasith Malinga’s wide, full deliveries at the World Cup T20 final earlier this year. A three-way race for one spot in the middle-order: In spite of Ajinkya Rahane’s consistency at the top, he is likely to vacate that position once Rohit re-enters the playing XI. With Kohli and Suresh Raina having cemented their places, and India showing a preference for five specialist bowlers of late, this leaves a single spot at number 5 open. Yuvraj could be in a three-way race with Rahane and Ambati Rayudu for it. Let me stick my neck out further and state that Rayudu will not make that cut, and it could eventually boil down to a face-off between Yuvraj and Rahane for that opening. Shikhar Dhawan’s form: While Dhawan has been rampant on flat pitches in India, in the past, his technique has been found wanting on tracks with pace and bounce. His position in the World Cup XI would depend largely on his performances during the tri-series Down Under in January 2015. If he fails, Rahane will be promoted as the designated opener along with Rohit, and the middle-order race will suddenly revolve predominantly around Yuvraj and Rayudu, one that the left-handed stalwart is likely to win, in what is perhaps the best-case scenario for him. As fifth bowler: Given his prowess with the ball in the previous edition, Yuvraj could compete with Ravindra Jadeja for the fifth bowler’s role, though the scenario is unlikely, given Dhoni’s penchant for backing certain players to the hilt, a category in which Jadeja currently finds himself. However, in case the think-tank reverts to India’s time-tested strategy of seven specialist batsmen, some of whom can combine to become the fifth bowler, Yuvraj’s chances will considerably increase. None of these scenarios stands a chance unless the authorities take the risk of considering a player absent from the format for close to a year now. That consideration, if it does happen, would certainly defy logic, but then, the man’s story seems to evolve from the heart, as opposed to a more logical origin. Aged 32, Yuvraj’s life has been akin to a movie script, containing several elements any sports-drama genre fans would crave. Going by the script revealed to us thus far, it would be quite disappointing if the climax is anything less than a befitting tribute to one of the greatest legends Indian cricket has ever produced. Yuvraj deserves, both emotionally and realistically, a final shot at defending the trophy he won four years ago, almost paying the ultimate price in the process, before bringing the curtains down on a mercurial and glorious career. While this adage is applicable to almost any situation in life (and across genders), in the cricketing context, the greatest ‘hour’ comes once in every four years when the top teams in the world converge to battle it out to determine the greatest among them all – at least till the next time the epoch event occurs. True to the saying, several men have indeed stepped up to the occasion: some were excellent exponents of the game who stretched the limits of the high levels they themselves set on lesser platforms, while others shone in a different light altogether when performing on the biggest stage of cricket. The following is the Part 1 of a dual series dedicated to identifying these World Cup (WC) specialists, with the current instalment focusing on bowlers who have upped the ante when their country needed it the most. Score: This has been calculated by multiplying the three essential parameters a bowler is assessed upon – Average, Economy Rate (ER) and Strike Rate (SR). For example, a bowler with an average of 20, an ER of 4, and an SR of 40 will have a score of 20 x 4 x 40 = 3200. As with most statistics associated with bowling, lower the score, better is the performance. Greater the difference between their career scores and the WC scores, the higher will the bowler feature on this list. Do note that the focus is not on absolute WC performances, but relative to the bowler’s overall career, which is why the highest wicket-taker in the World Cups barely makes it to this list, and numbers two (Muttiah Muralitharan just misses out) and three (Wasim Akram’s WC performance actually dips slightly below his overall) do not feature at all. Read on, and take a call for yourself if statistics do paint the true picture or not. The highest wicket-taker in the history of the 50-over World Cup, Glenn McGrath just about makes it to this list, simply because he was almost as good throughout the rest of his One Day International (ODI) career. Covering four WCs from 1996 – 2007 in his long stride, the lanky pacer racked up 71 wickets at an astounding average and an ER of 18.19 and 3.96 respectively. After a forgetful 1996 WC, McGrath stamped his authority over the 1999 edition in England, picking 18 wickets to finish a touch behind compatriot Shane Warne and Kiwi Geoff Allott (both with 20 wickets). While he strung together several consistent performances, the 5-14 against West Indies at Manchester, which included castling Brian Lara with a peach of a delivery, was the most memorable. The Pigeon went from strength to strength in his next two WCs, picking up 21 and 26 wickets in the 2003 and 2007 instalments respectively, winning the Player-of-the-Tournament award in the latter, which was also his final international appearance for Australia. McGrath’s 7-15 against minnows Namibia in the 2003 edition remains the best bowling figures in a WC till date, which he followed up with a number of clinical spells, including a 3-wicket haul against India in the final to ease the Aussies towards their second WC on the trot. An amazing feature of McGrath’s performance in the 2007 Cup, held in the West Indies, was his unwavering consistency in terms of picking wickets: he did not go wicket-less in any game and picked up three-wicket hauls in 6 out of the 11 matches played. The Aussies missed him in 2011, and, in their quest for the 2015 WC, will be desperately hoping for someone to step into those large shoes and replicate, to some extent, the iron-hold he had on the marquee tournament in cricket. Credited with bowling the third fastest delivery in international cricket history, Brett Lee, though quite successful, fell slightly short in terms of the huge potential he exuded after bursting onto the scene during the 1999-00 Test series against India. Lee made it to number nine among highest wicket-takers in WCs despite playing at least one tournament lesser than everyone else ahead of him on that list (he missed the 2007 WC on account of injury). Lee had an excellent 2003 World Cup, finishing as the second-highest wicket-taker (behind Chaminda Vaas) with 22 wickets at an average of 17.9 and an acceptable ER of 4.73. The tearaway quick’s five-wicket burst in the Super Sixes round subjected New Zealand to the ignominy of being bowled out for 112 and all but cemented Australia’s place in the semi-finals. Lee was particularly effective against sub-continental teams, picking three wickets each against India, during the qualifying round, and Sri Lanka, in the crucial semi-final. The right-hander’s tight spell of 2-31 in the all-important final against India, in partnership with McGrath, snuffed out any hopes which the batting team may have harboured while chasing the imposing target before them, to help Australia win their third WC crown. Though included in Australia’s WC 2011 squad, questions were being raised on his ability and match fitness, but Binga silenced critics by ending up as Australia’s highest wicket-taker in the tournament and often waged a lone battle against opponent batsmen, with most of his fellow bowlers having a miserable WC. Facing Pakistan in a must-win encounter (to avoid meeting India in the quarters) in their final qualifying match, the Australians were bowled out for 176. Lee bowled his heart out during the second innings, but his 4-28 was the only spell of note as Pakistan squeezed home to a four wicket victory. The mainstay of Sri Lanka’s pace bowling attack through the mid-90s and early 2000s, Chaminda Vaas played in four WCs from 1996 to 2007 and is number 4 in the list of highest wicket-takers in ODI WCs with 49 wickets. While he wasn’t too successful in the first two, the left armer topped bowling charts in the 2003 WC in South Africa, picking up 23 wickets at an average of 14.4 and an economy rate of 3.76. He used his experience to good effect against weaker sides, decimating Bangladesh with a six-wicket haul, which included a hat-trick in the first over, and leaving minnows like Canada and Kenya clueless as he regularly made the ball talk, in helpful conditions. In a close game against the West Indies, his 4-22 and 25-ball 28 proved decisive, winning him the Player-of-the-Match award. When Sri Lanka ran into the rampaging Australian side in the semi-finals, Vaas accounted for Matthew Hayden and Ricky Ponting, India’s wreckers-to-be in the final, cheaply, and his three wickets were instrumental in restricting the Aussies to 212; however, a poor batting display saw the Lankans fall well short of the target and knocked out of the tournament. In the process, as reported by the BBC, Vaas broke the record for the highest number of wickets in a single WC, which he would hold till the next edition when McGrath took over the mantle. In the twilight of his career, Vaas came up with yet another admirable showing in the 2007 WC, picking up 13 wickets at an average of 22 and an economy rate of 3.68. His consistency was a crucial factor spurring the Lankans to the tournament final where they again ran into Australia, their nemesis from four years back, and abjectly surrendered, incidentally the only match wherein Vaas went wicket-less and was expensive (ER of 6.75) by his own high standards. Probably the biggest surprise on this list, New Zealand all-rounder Jacob Oram lifted his performance several notches during all the three WCs he participated in from 2003-11. Unsung like several of his national teammates, the Kiwi has a very respectable overall bowling record: 173 wickets at an average of 29 and an economy rate of 4.4. Also taking into account his power-hitting abilities, the big all-rounder has been an indispensable asset for the Black Caps over the past decade. The highest podium of ODI cricket seems to make his apparently innocuous bowling even more potent; Oram is on number 8 in the list of highest wicket-takers in ODI WCs, fitting in with remarkable ease among some of the biggest names in world cricket. In line with his overall on-field persona, the all-rounder never looked spectacular, but did his job with even more clinical efficiency when the stage was the biggest. While his numbers, across all three WCs he participated in, indicated a significant leap from the usual, it was in the 2011 WC that he was at his best, picking up 12 wickets at an average of 18.4 and an SR of 24.9. Particularly memorable was his Player-of-the-Match earning bowling performance against the Proteas in the third quarter final at Mirpur, where, defending a mediocre total of 221, his 4-39 broke the back of the South African batting line-up and propelled the Kiwis into their sixth WC semi-final. As reported by the Telegraph, the tall all-rounder had quit Test cricket in 2009 with the aim of being in contention for the 2011 WC. Given the results, the move definitely paid off. Though his overall figures in ODI cricket are superior to those while playing in whites, Zaheer Khan is often hailed as the best Test medium pacer to have graced the country in the new millennium. This is probably because he is well known to have been influential in several overseas Test victories, whereas his ODI career, marred with injuries, has had a relatively fewer spread out match-winning performances, with approximately 1/6th of his career wickets coming in two tournaments – the 2003 and 2011 WCs, held in South Africa and the Indian sub-continent, respectively. Number 5 in the list of highest wicket-takers in ODI WCs (tied with compatriot Javagal Srinath) with 44 wickets, the left-armer announced his arrival on the biggest stage of cricket in the 2003 edition, when – coming off the back of a confidence boosting bowling performance in New Zealand a couple of months back – he spearheaded the Indian campaign, well aided by Srinath and Ashish Nehra, together forging the best ever display of pace bowling by an Indian team witnessed by me in a single tournament (barring the final), which culminated in one of the most amazing runs by India in a marquee tournament in alien conditions. His spellbinding run in the tournament included the annihilation of the familiar Kiwi batsmen, and his four wickets sent them plummeting to 146 all out, resulting in an easy victory for India. While it is a pity that the rest of his ODI career has not been able to match up to the standards set during the World Cups, this makes a strong case for the left-armer’s inclusion, if fit, in India’s squad for the 2015 tournament. Last week I was getting all set to write an article on the (then) ongoing series between India and the West Indies, the initial couple of matches of which had shaped up much better than anyone had thought. With India expected to steamroll the team languishing at the 8th spot in the ICC One Day International (ODI) rankings, most people were almost disinterested in the run up to the series, with the only debates revolving around the margin of India’s victory and performances of some of the younger players the team looked set to blood during an ‘easy’ series. After the Caribbean team performed as expected in the warm-up games against India A, the first unpredictable, and therefore exciting, incident occurred just before the first ODI kicked off in Kochi, when captain Dwayne Bravo conveyed his displeasure over an agreement between the West Indies Players Association (WIPA) and the West Indies Cricket Board (WICB) regarding players’ pay and conditions, even threatening to pull out of the opening game in protest. ‎ Maybe WIPA problems galvanized players but I doubt it. I don’t think anything miraculous. as you put it, happened either. They always had the ability to do well, especially in the shorter formats. They are always susceptible of collapsing too as the showed in the second game after being in a good position. Hopefully they are beginning to string together more good performances than bad ones. While the the 3rd ODI in Visakhapatnam was called off due to Cyclone Hudhud, not many would have predicted the storm that followed. The drama unfolded a few hours before the 4th ODI on October 17th, in picturesque Dharamsala, ironically the abode of 1989 Nobel Peace Prize winner, the 14th Dalai Lama. West Indies yet again threatened a pullout, and consented to play only after much cajoling by BCCI joint secretary and Himachal Pradesh Cricket Association (HPCA) president Anurag Thakur. The toss itself was quite a spectacle, with the entire West Indian team accompanying Bravo out to the middle, where he explained that they did not want cricket or the fans to suffer, but ‘it’s time to take a decision’. During the course of the match, the cryptic ‘decision’ came to light, and after some confusion, it became clear that the West Indies cricket team were to depart for home after that match, and the 5th ODI in Kolkata was effectively canceled. More than the disappointment of an ODI in my hometown getting struck off, the sight of the West Indians practically sleepwalk through the game was deplorable – catches were dropped, explosive batsmen like Kieron Pollard invoked images of Geoff Boycott at his most stubborn with a Strike Rate below 20, and an overall air of disinterest hung heavy. Marlon Samuels managed to convert the macro-level disinterest into lazy elegance for his second century of the series, and Andre Russell hit some lusty blows towards the end, but the match seemed over as a contest right from the dramatic toss, and the 59-run victory for India was a mere formality. As news emerged that the deal struck between the WIPA and the WICB, without consulting the players, would result in match fees being reduced by up to 75%, with image rights and ICC fees reduced almost 100%, I could agree that the protest had a valid reason behind it. However, the question to be asked is, was it justifiable to pull out unceremoniously from an ongoing series, with plenty of locked-in commercial and sporting interests, or would it have been more reasonable to carry out the threat by boycotting the next series (in South Africa, starting December), which would minimize losses inflicted on both organizers and public, and be targeted mostly at the alleged perpetrator of the crisis, the WICB. In hindsight, with the BCCI having absolved the cricketers of their ‘crime’, and establishing the WICB as the sole antagonist in the entire episode, this seems to have been an excellent move from the players. A pullout in South Africa, through more acceptable on humanitarian grounds, would not have created the kind of buzz generated after tinkering with the richest cricket board and over a billion potential spectators. Even as I write this, the WICB is attempting to salvage relations by seeking a meeting with the BCCI, in the wake of suspension of ties and possible legal action against the former to account for losses allegedly amounting to $65 million due to the premature tour termination, but unless a dramatic twist occurs and the blame is shifted back onto the players, Bravo appears to have succeeded in what was a high-risk-high-return gamble. The incident, not an isolated example, but definitely one which trended heavily, given the large, social-media friendly population in the country, is a stark reminder that, at the end of the day, cricket is also a job, and recent turn of events have highlighted that, in an adverse situation, irrespective of whether one goes about their duties with a willow and red cherry, or ply their trade in an establishment with clearly demarcated boundaries between owners and working class, the nature of protest is not all that different.